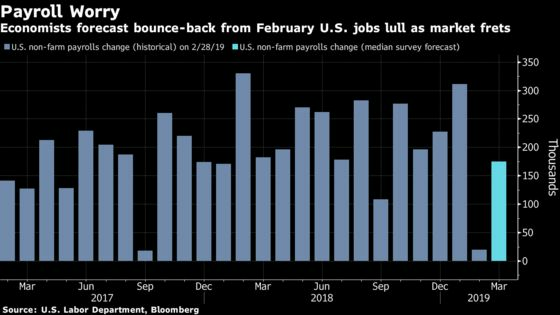 While Friday’s jobs report is expected to show payrolls rebounded in March following the weakest reading since 2017, economists forecast a 175,000 gain. That would be a moderation from last year’s average as business investment slows and headwinds gather. It’s a huge shift from early 2018, when accelerating wage gains spurred financial-market turmoil amid concern the Fed would raise rates more aggressively. With inflation muted and economic growth cooling, those concerns have faded, and the central bank has scrapped expectations for rate hikes this year while it monitors how the U.S. weathers a global slowdown. If payrolls miss expectations, “people are going to say we’ve had two consecutive weak numbers, maybe growth is probably losing some momentum,” said Alex Li, head of U.S. rates strategy at Credit Agricole SA in New York. 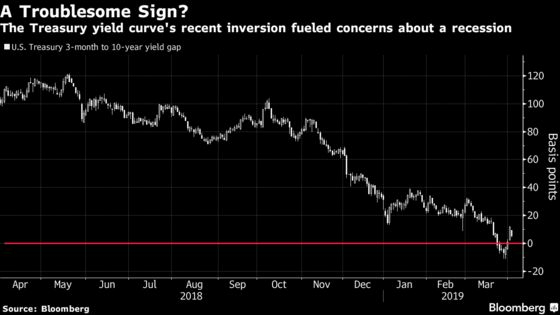 That could reignite fears of recession and wipe out this week’s increase in Treasury rates, taking the U.S. 10-year yield back toward its late-March low, Li said. The labor market is set to take a step back this year, as the effects of tax cuts fade, companies find fewer workers and cooling global growth filters into investment decisions. The question now is how quickly and how hard this shift happens, with the March data setting the trend after a February that economists largely discount as an anomaly due to weather and data-collection disruptions. Signs have been mixed ahead of Friday’s figures. A private report on Wednesday showed U.S. companies in March added the fewest jobs in 18 months, while the Labor Department said Thursday that filings for unemployment benefits fell last week to a 49-year low. While a confluence of domestic and external factors is depressing the economy’s performance, we expect most of the issues to be temporary and are therefore wary of being overly pessimistic about the overall outlook and job growth. Click here for the full weekly preview. Traders and investors will likely treat a weaker-than-forecast payrolls figure as vindication for bets that a recession is closer than thought. Market expectations for the Fed to cut interest rates at least once this year have grown, and in March the gap between 3-month and 10-year rates inverted for the first time since 2007. While such a shift is seen as a harbinger of recession, subsequent moves have since restored the 10-year note’s yield premium. A weak report would also be a major blow to risk appetite, according to Jason Celente, senior fixed income portfolio manager at Insight Investment. It would upend the recent “bad news is good news” sentiment, whereby stocks and credit traders have benefited from weaker data, because it suggested the Fed would ease to maintain overall economic strength. Now, that strength is being questioned. The 10-year rate, which dipped as low as 2.34 percent late last month, is currently 2.51 percent, marginally above the top of the Fed’s target range for overnight cash. Even with the move in Treasuries, stock investors have shown some optimism: the S&P 500 Index has continued to rally this week after capping its best quarterly surge since 2009. One sector seeing mixed prospects is manufacturing. The Institute for Supply Management survey of factories topped estimates in the month, led by a jump in the employment component, but the ADP Research Institute’s report showed the biggest drop in such jobs since 2016. The government’s latest report showed the industry in February added just 4,000 workers, the fewest since 2017. The unemployment rate is expected to remain near a five-decade low Friday as annual wage growth holds at a 3.4 percent pace, which would continue bolstering consumer finances and buoy spending in the second quarter. This time around, such pay gains are unlikely to spur inflation concerns at the Fed, where officials have stressed a message of patience amid the Trump administration’s call for a cut.